NICE Quality Standard (QS) 9 covers the assessment, diagnosis, and management of chronic heart failure (CHF) in adults aged 18 years and above. It was first published in June 2011 and has recently undergone a substantial update;1 the current update results from the 2014 review of quality standards, which identified that changes were needed to areas for improvement in managing CHF. It included changes to all the 2011 quality statements as well as the addition of two new quality statements, one on review after changes in medication and another on options for cardiac rehabilitation. a combination of valvular disease, arrhythmias, and ventricular dysfunction. The most common cause underlying CHF is coronary heart disease (CHD), with most patients having previously had a myocardial infarction.1 The majority of evidence for management is for heart failure due to the first category listed above (i.e. LVSD) as outlined in NICE Clinical Guideline (CG) 108,2 which is the evidence base underpinning this standard. Why was the quality standard needed? more effective treatments for CHF. The quality statements in NICE QS9, as modified, can be seen in Table 1 (below) and are discussed below. The 2011 statements, although no longer considered national priorities for improvement, may still be used at a local level and are underpinned by current accredited guidance.1 The updating of the quality statements has resulted in a general simplification, which in turn should make their use in day-to-day clinical practice easier. 2 Adults with suspected chronic heart failure and either a previous myocardial infarction (MI) or very high levels of serum natriuretic peptides, who have been referred for diagnosis, have an echocardiogram and specialist assessment within 2 weeks. [2011, updated 2016]. National Clinical Guideline Centre. 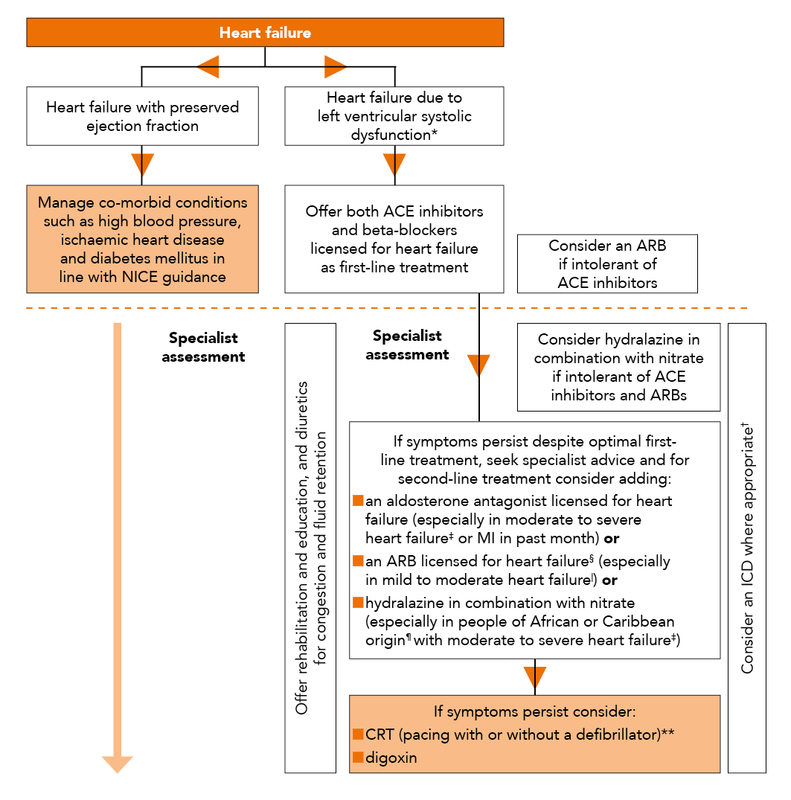 Chronic heart failure: the management of chronic heart failure in adults in primary and secondary care. London: National Clinical Guideline Centre, 2010. Statement 2 refers to the need for people suspected of having CHF and who have either a previous MI or very high levels of serum natriuretic peptides (in those without a previous MI) to be seen for echocardiogram and specialist assessment within 2 weeks of referral. Patients in this category have a higher likelihood of heart failure and, because of the poorer prognosis, it is important that they are commenced on appropriate preventative medication as quickly as possible to reduce any further long-term heart damage. an N-terminal pro-B-type natriuretic peptide (NTproBNP) above 2000 pg/ml. * For more information on drug treatment see appendix D of the NICE guideline and ‘Chronic kidney disease’ (NICE clinical guideline 73). † Consider an ICD in line with ‘Implantable cardiovascular defibrillators for arrhythmias’ (NICE technology appraisal guidance 95). ¶ This does not include mixed race. For more information see the full guideline at www.nice.org.uk/guidance/CG108. 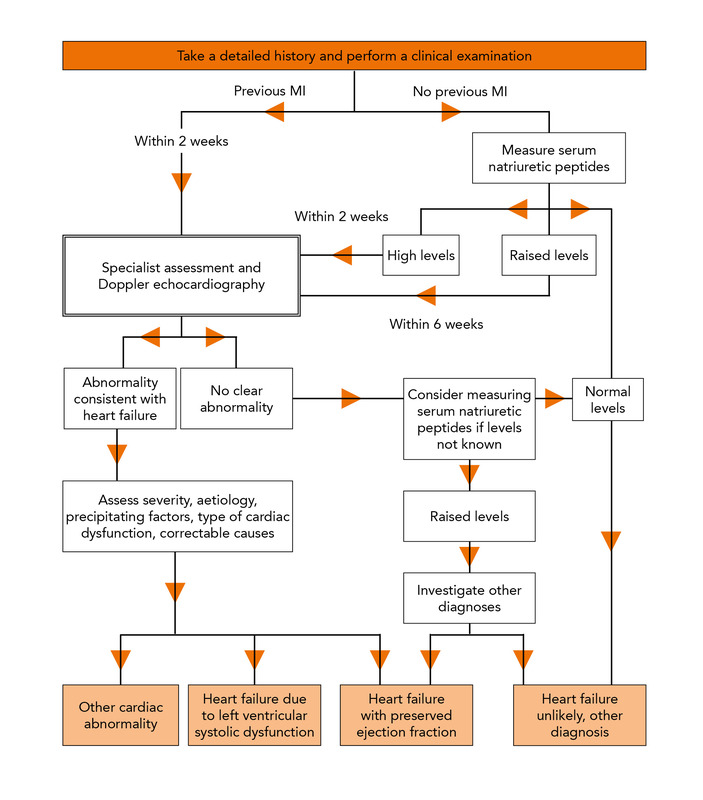 The timescale for review after any change in dose or type of heart failure medication is 2 weeks, and health professionals and service providers, including GPs, should ensure that systems are in place to make sure this review takes place.1 In addition to performing the checks outlined under statement 3 above, this is also an opportunity to monitor medication effectiveness, the need for any changes, and to consider whether any other multidisciplinary team members should be involved in the patient’s care. NICE defines people with stable chronic heart failure as: ’Adults diagnosed with chronic heart failure whose clinical condition has not deteriorated, whose heart medication has not been changed and who have not been admitted to hospital because of heart failure.’1 In addition to patient review after a change in medication, people with stable CHF should be reviewed every 6 months by an appropriate member of the multidisciplinary team. The review will consider whether there has been any change in their condition, what medication changes may be needed, and the possible need for other suitable treatments or referral to another member of the team. See Box 3, above, for NICE’s stated minimum recommendations for this review. Statement 7 is an example of a developmental quality statement that sets out a ’cutting-edge’ service or technology currently only found in a minority of providers.1 It involves putting in place significant changes such as a service redesign or new equipment. For patients with CHF, this means offering cardiac rehabilitation at different times of the day including outside of normal working hours, at different venues (at home, in the community, or in a hospital setting), and also offering alternatives to group-based programmes. This approach is likely to increase both uptake and adherence and also to improve the patient experience. Additional measures, such as providing transport for people to attend sessions to ensure quality of access, should be offered but this will have additional cost implications. In patients with CHF due to LVSD, Quality and Outcomes Framework (QOF) data have shown high levels of uptake of ACE inhibitors or angiotensin 2 receptor blockers (ARBs) (around 98% in 20156), and a rising level in the addition of a beta blocker to ACE inhibitors and ARBs (i.e. from 83% in 20107 to 92% in 20156). Another source of data, especially if QOF is no longer to continue, is the National Heart Failure Audit compiled by the National Institute for Cardiovascular Outcomes Research.8 The most recent report9 (covering April 2013 to March 2014 and published in November 2015) analysed secondary care data fields, some of which are relevant to the implementation of the updated NICE QS9, but has yet to demonstrate a year-on-year improvement in the use of preventative medication. Implementation of updated NICE QS9 should in time drive up the quality of care and improve clinical outcomes in patients with CHF, despite the planned changes to QOF and current service challenges; however, without QOF as the basis and measurement of standards in primary care, any improvement may be even harder to achieve. Tools to help professionals with implementation and audit can be found in the resources section of QS9. be made available and accessible at different times of day, places, and formats to suit individuals and encourage uptake. Statement 7: Proportion of people referred to a programme of cardiac rehabilitation who are offered sessions during and outside working hours, and the choice of undertaking the programme at home, in the community or in a hospital setting. NICE (2016). Chronic heart failure in adults. Quality Standard 9. NICE, 2011, modified February 2016. Cowie M, Wood D, Coats A et al. Survival of patients with a new diagnosis of heart failure: a population based study. Heart 2000; 83: 505–510. NICE website. Chronic heart failure [QS9]. Uptake data for this guidance. www.nice.org. uk/guidance/qs9/uptake (accessed 4 April 2016). QOF database. Heart failure, 2015.www.gpcontract.co.uk/browse/UK/Heart%20Failure/15 (accessed 15 April 2016). QOF database. Heart failure, 2010.www.gpcontract.co.uk/browse/UK/Heart%20Failure/10 (accessed 15 April 2016). National Institute for Cardiovascular Outcomes Research. www.ucl.ac.uk/nicor (accessed 4 April 2016).